Kim Wells is a senior international trade specialist with 19 years of experience supporting commercial space exports. By now, you’ve heard the news—for the first time ever, a commercial company has launched to and berthed with the International Space Station! On May 22, SpaceX successfully launched its Falcon 9 rocket and Dragon capsule from Cape Canaveral, Florida to resupply the Station. 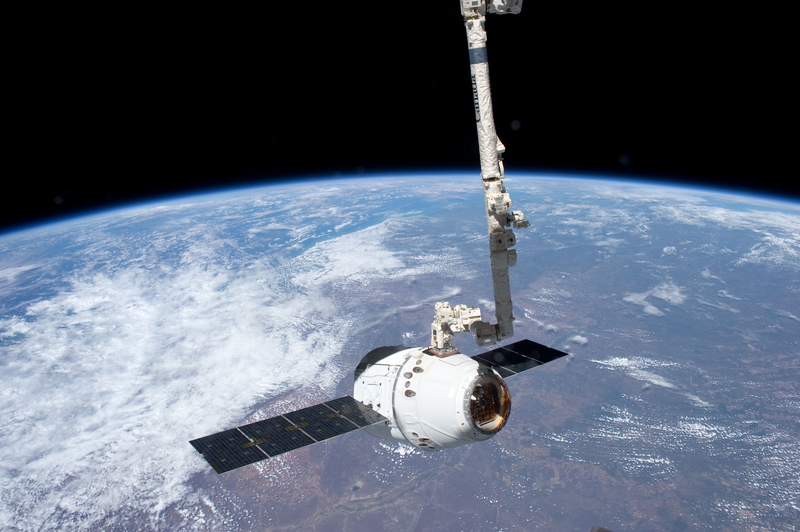 After three days of very precise maneuvers, the Dragon capsule then berthed with the Station and the astronauts, representing Russia, Europe, and the United States, opened the hatch door to welcome a new world of commercial space ventures. Until now, this type of exploration activity in space had only been attempted by very few governments and no private companies. But space exploration isn’t cheap, and with the retirement of the Space Shuttle, NASA sought a more cost-effective way to re-supply cargo to the Station. The result was NASA’s Commercial Orbital Transportation Services (COTS) program, in which SpaceX and Orbital Sciences were selected to develop the ability to delivery cargo—and potentially, crew—to the International Space Station so that NASA could begin to focus its efforts on more challenging exploration ventures—like returning to the Moon or traveling to Mars. On top of that, using commercial services for resupply is projected to save NASA up to $4 billion. In just four and a half years, and only $300 million dollars, the all-American Falcon 9 rocket went from a blank sheet to first launch. Hopefully, this successful launch and docking will be just the first of many, many commercial trips that support the international exploration of space. The International Space Station has always been a collaborative venture. Japan, Russia, Europe and many others contributed to its construction and continue to support its operation. But never before has the private sector been involved. Until now. This opportunity was also a big change for SpaceX. Founded in 2002 by PayPal entrepreneur Elon Musk, SpaceX has privately built the Falcon 1 and Falcon 9 rockets from the ground up in its Hawthorne, California facility. SpaceX employs over 1,800 people in high-tech jobs primarily in California, Texas and Florida, but also supports over 1,700 suppliers nationwide. In fact, each Falcon 9 rocket launch supports over 750 jobs—220 at SpaceX and another 530 indirect positions! The mainstay of any commercial rocket business is launching satellites. We use satellites each day –whether we know it or not. Rockets like the Falcon 9 have launched everything from communications satellites (so you can call your friends), GPS satellites (so you can find out where to go meet them), remote sensing/imaging satellites (so you can have an accurate map and picture of where you’re going), and broadcast satellites (so you can watch TV once you arrive). In 2011, there were 18 commercial satellites launches around the world, which generated approximately $1.9 billion in revenue from the launches alone. Most of those satellites were built in the United States, supporting thousands more high-tech jobs in suppliers across the country. In addition to U.S. manufacturing, thousands of more jobs are created in the satellite services sector. The commercial space sector provides jobs, and spurs innovation, exploration, international cooperation and partnerships. While supplying the Space Station via commercial transportation is good business, its high-profile mission is also great advertising for the more traditional business line of launching satellites for customers–foreign and domestic. The International Trade Administration works to support this type of advancement, not just at SpaceX, but for all U.S. companies. SpaceX and other commercial space companies have worked closely with offices in the Commercial Service and Manufacturing and Services to identify foreign opportunities and address policy concerns that could impede their competitiveness. This effort is a historic accomplishment for NASA, SpaceX, and the American space program, borne out of the ingenuity, hard work and determination to restore America’s domestic access to the International Space Station. As a nation, we should be proud of this example of American innovation and technological achievement, the economic benefit that it provides to U.S. citizens and overarching rewards that are shared by people around the globe as we explore space together.